I had handled all of my conference obligations. The quiet of my hotel room and the king-sized bed were welcome rewards. Then the phone rang. "Hello," I said, trying to sound a little energetic. "Hi Ronni. Eric Lewis here. Hey, I know you're leaving soon and I'd like to see you tonight. Please say yes?" There was something different in Eric's request. Maybe he thought I would be a cure for his being homesick. I wasn't quite sure, but something in his voice connected and I knew I couldn't refuse him, and said yes. "I'm on my way. Be there in a few." Click. ------------------------------------- As I drove closer to the hotel I wondered whether I would be met with any of Ronni's famous silver bullet questions. What was I thinking coming over like this? Did I think that she'd fall all over me? Of course not. She's an amazing woman and I know it usually comes back to God with her. Any answer I might give without some spiritual connection would probably be shot down so I thought, even before I arrive, I may as well prepare to exit as gracefully as I could. ---------------------------------------- I fell back on the bed. What was I thinking? I didn't want to fall victim to one of my flesh backs - that passion-plagued pothole that was once Eric's and my trademark. I looked in the mirror. I heard a scream and realized it was coming from within me: Help me somebody? H.V. Bennett and W.E. Lawson offer a unique female/male perspective of "She Thought, He Thought," moreso than "She Said, He Said." These fictional characters may ring true for many readers. Is this love deferred a delay, a deception, a delight, or a delusion? Is it Man-Manufactured or God-Given? 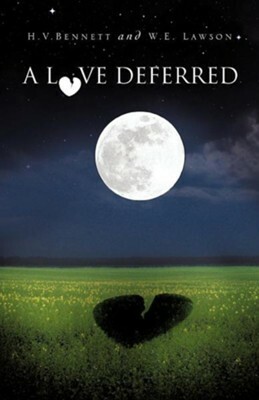 I'm the author/artist and I want to review A Love Deferred.